Remember Harold Kushner’s best-selling book, When Bad Things Happen to Good People? Sometimes those “people” are our children. It would be wonderful if we lived in a state of nirvana but, unfortunately, we have to function in the real world and sometimes that world is not as kind to our kids as we would hope. But do you even wonder why some kids seem to survive the downsides, such as bullying and harassment, more than others? Why some kids can be on the receiving end of mean behavior but somehow, they maintain their confidence? Were they born that way? Were they trained and encouraged to be resilient? Resilience is a skill that even as full-grown adults, we can and should continually build but it’s also something that often plays to the strengths of kids. Being a successful entrepreneur is less about having certain technical abilities or business acumen. That stuff is easy to figure out. It’s the “soft” skills training, in particular resilience building, which determines long-term business success. 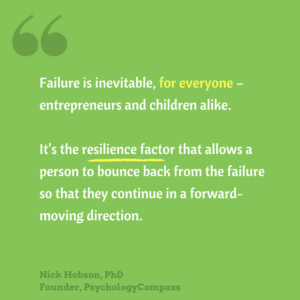 Entrepreneurship is the perfect life model for building resilience in kids. Much like the life of a young person, the start-up world is rife with personal setbacks, unexpected wrong turns, and emotionally trying times. It’s inevitable. So what matters most isn’t avoiding failure (good luck with that), but rather an ability to bounce back from difficult times and to see the less-than-ideal moments as opportunities for personal growth. 1. Breed a general curiosity. Inquisitiveness and interest is a natural antidote against the pain of failure. The reason is because the behavioral output of interest is exploration. An explorative mindset is one that is open to new ideas, experiences, and behaviors. A child with heightened curiosity will want to explore a failure – to see where things took a wrong turn, and why. In this state, failure opens doors for future change. The opposite, a closed-off mind, lead to failure being perceived with a sense of finality – an end-of-the-line stop that leads nowhere. Successful entrepreneurs not only accept failure; they relish in it, knowing that it is a transition point for future opportunity. Much of life and business is about imagining the ideal scenario, regardless of what’s actual going on in reality. What we imagine or visualize happening in our mind kick-starts a real regulatory process in our brain and behavior, such that the imagined eventually becomes the real. To the brain, there’s little difference between the two states. The same brain regions are activated when we visualize a behavior as when we actually engage in the physical act. It’s the reason why athletes visualize a perfect performance before a game. Mentally simulating an ideal state or behavior is a flexible skillset that can help a child respond to life’s difficulties. With honed visualization skills, any unpleasant situation (even those completely beyond a kid’s control) can be counteracted with positive mental imagery. Mentally tough, resilient entrepreneurs know themselves well. The opposite state of resilience – crippling dread and burnout – happens to those who have poor self-awareness. Poor self-awareness creates a lasting discrepancy between a person’s actual self/reality and their ideal self/reality. A theory in psychology called ‘self-discrepancy model’ says that we all have an idea of who we want to be (the ideal) and who we really are (the actual). Resilient people have little discrepancy between the two. The starting point to make this happen, even in young children, is to first know what that ideal is, or what it could be. Resilient people and resilient kids know themselves and they know the reality of the situation. Children who are taught to be introspective at this level stand a far better chance of standing up to failure because they will learn an invaluable skill: to know how far off they are from their internal compass. It offers a direction, a starting point for turning things around in their favor. We may not be able to prevent the inevitable hardships along the way, but raising mentally tough – as well as kind kids — is a winning leadership combination that will help them no matter what path they take.